Before this year, there weren’t many spots in Denver where an unemployed person could get help stepping back into the job stream. 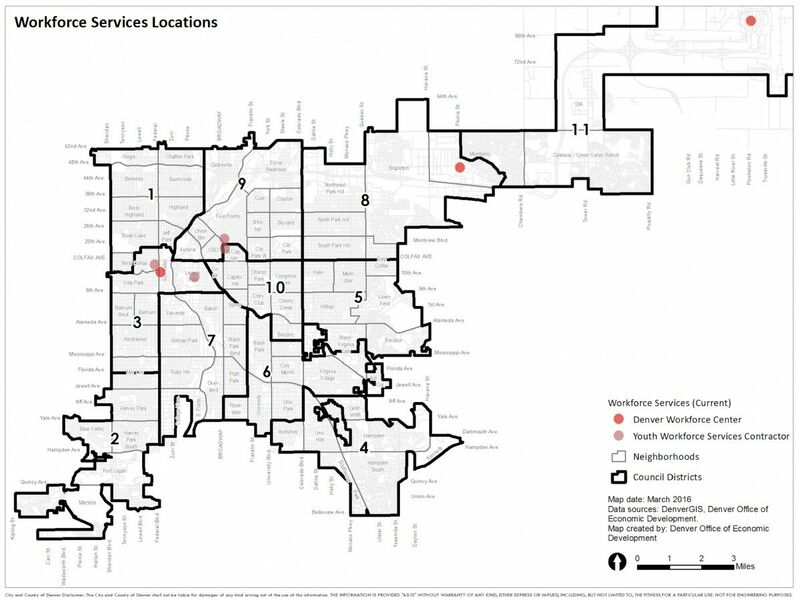 A small cluster of employment service centers were huddled in the heart of the city, but most of its 11 districts were largely unserved. Now that the Office of Economic Development (OED) has decided to divide Denver’s job training programs out to private contractors, the number of government-funded work and economic assistance centers will jump seven-fold, going from seven to nearly 50 and spanning across all 11 districts instead of only five. Denver started transitioning over to this model in May, and it marks the start of an incoming sea change in the way local and state governments locate their workforce development, youth employment and temporary assistance for needy families (TANF) services. On August 19, the Department of Labor made final a new addition to its flagship law on federal funding for job training programs, the Workforce Innovation and Opportunity Act (WIOA), which will require departments like Denver’s OED to branch its services out to third-party contractors. Decentralization isn’t a new phenomenon in this field. Cities like Austin, Seattle, Pittsburgh, Kansas City and numerous others already hand funds and guidance to local agencies and workforce centers. At the state level, California has long depended on local centers to help provide job training for youth, veterans, the elderly and others with barriers to employment. But because of the budget stresses local governments face, and the lack of a national system to really record how successful these programs are at getting people into jobs across the long term, the federal government is hoping that creating ecosystems of state, federal, local and private job programs will amplify the effect of WIOA funds. New York, Chicago, Detroit and Miami will be some of the first to join Denver, as they’re currently at work drafting out their own decentralization plans. Contracting out to centers that are already up and running near low-income or underserved areas reduces staffing costs for local governments. It also raises the prospects that WIOA programs will have a bigger impact in cities if their practitioners are already embedded in communities that need the most help. Bryant, who used to work at the Chicago Housing Authority, says she’s seen what it’s like when someone needs economic help but they can’t figure out the offices to visit or phone numbers to call to get what they need. “It takes a while for these communities to get through the red tape and bureaucracy of municipalities, so what these agents are going to bring is a lot more flexibility,” she says. Since Denver started piecing together this model at the end of 2015, it has struck up deals with Mi Casa, a local workforce center that focuses on Latino families, and Denver Public Schools to act as “one-stop” service centers for low-income residents. At various spots throughout the city, customers will be able to apply for TANF benefits and skills training programs, and get info for vocational and college programs all under the same roof. With this new system, Bryant says that a mother of five who’s out of work can take a skills-building course at a nearby high school computer lab. In the past, she would have had to find the time to drive downtown and walk into one of the city’s economic development offices, and petition for economic help in a room that “feels like a DMV,” she says. Prior to WIOA, the U.S. Department of Labor reports that there was such a disconnect between employer needs and workforce development centers that people were getting trained for jobs with no local demand. In Denver, for example, the OED never monitored its employer and employee satisfaction rates after job placement. Low-income adults getting training through a WIOA-funded program in Denver in the past had about a 53 percent chance of landing a job, and the city’s partnerships with local employers averaged in seven job fairs each year. Now, OED expects job placement to rise to about 90 percent, and it’ll be hosting 25 job fairs across the city. The number of training program graduates is expected to get a boost too. With a new online training system, run through human services company ResCare, course completions are expected to rise from 156 to nearly 750. The city is expecting to save up to 20 percent of its current TANF and WIOA expenditures by shifting around these programs. Without so much weight at the top, this new ecosystem means a single department isn’t under the strain of deadlines or metrics that sometimes create more harm than good. “Everywhere we were skimming from the top of the job pool, and we were taking the most qualified,” Bryant says. Those who needed it least got the most OED support, she says, largely because the office had to hit its employment goals. The WIOA ruling comes nearly two years after the act itself was enacted, bringing a much-needed overhaul to a federal jobs program that looked great on paper but performed decent at best. A working paper by the National Poverty Center lists a dynamic array of studies on workforce development programs and their impact on the local level, with the general tone that these programs have a moderate to moderately favorable effect when it comes to getting people out of low-income and poverty households and into jobs that don’t only pay well, but offer chances for advancement up into the middle class. One study from 2009, called “What We Know About the Impacts of Workforce Investment Programs,” gave a particularly damning assessment of federal jobs programs of the past. “In brief, ‘most employment and training programs have either no impact or modest positive impacts’ and in many cases, programs’ net economic benefits to society do not outweigh their costs,” according to the National Poverty Center. As for whether or not Denver’s model will prove to be more effective, Terri Carpenter of the Sacramento Employment and Training Agency says she sees many benefits of decentralization. Her city has always relied on third parties to help deliver federally funded services.